I am one of the mentally ill, you might even say. And the gods talk to me. I have communicated with Norse Trickster Loki, and with myriad Shinto kami from Inari to Uzume to Amaterasu herself (and she’s every inch a Sovereign; none of this ooey-gooey pagan fluffy-bunny “patron goddess, work with me!” business. She is granting you an audience, foolish mortal!). I’ve had the Egyptian Cat Goddess Bast show up and make a demand of me (buy that statue) and then leave. 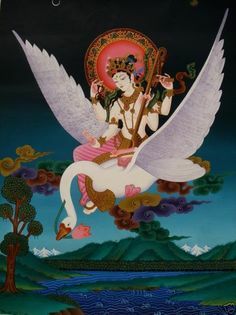 And of course, the Indian Goddess Sarasvati is immanent in me. But here’s the thing: I am not delusional. I have no history of psychoses. I have no history of disassociation. I have neither an individual history nor a family history of these issues, nor of bipolar disorder or schizophrenia, or any other mental illnesses that could cause delusional thoughts or behavior. I am not delusional. My mind is certainly not normal, but it is quite sound. It may not work as well as yours, but it is not making things up. I am sane. Never said anything about normal though. The major hangup I see is the idea that these gods are “talking” to me. The first thing I have to explain is that they are not “voices in my head.” When I (or, from what I have learned of other open-headed people) talk of the gods “saying” things, that is only because I for one have no better way of putting it. The gods usually give me impressions, sometimes almost in a literal sense. I feel what is being communicated. I do not hear it as a voice, as words. It doesn’t sound in my ears. It often seems more like a touch than a sound, yet it is a touch that triggers my brain to form words. You can call me a mystic. I cannot prove to you that what I say is the truth, but I will say that I am being both honest and earnest. Do you want to say that this is all in my head? You are probably right. But why can’t the gods be in our heads as well as in the heavens? I love incense. I love the glowing tip at the end of a joss stick. I love the way fragrant smoke curls from the powder burning on a charcoal briquet. I love the way the scent itself is so warm. And the scents….I love the scents: cedar, sandalwood, frankincese, myrrh. All the resins and spices that grew hundreds of miles distant from one another, all of them coveted treasures, brought together and blended into something new and something greater than even those rare parts. Most incenses on the Western market these days do seem to be Indian in origin or at least inspiration. However, a small number come from another country which has a glorious and often-overlooked history of blending scents: Japan. The Japanese obsession with fragrances dates back to the Heian period, when aristocrats (especially women) blended their own signature scents (incenses) to use as perfumes for their clothes. Unlike in later centuries, when the appreciation of incense would become streamlined into discriminating between different specimens of aloeswood, the Heian elite preferred true blends. The ingredients for these were wide and exotic, but quite recognizable to incense aficionados today: animal musks, various spices, fragrant resins. These ingredients were pounded, mixed together, and bound into a hard ball with some sort of neutral or sweet-smelling binder (usually honey). They were then sealed in earthen jars and buried in the ground to cure for as long as three years. Fragrance was an incredibly important part of a Heian man’s sexual appeal, if we are to believe female authors like Murasaki Shikibu. Her heroes – Niou, Kaoru, and of course Genji himself – are all described as smelling irresistible, and this is explicitly part of their charm. The power of fragrance can be better understood if we take into consideration the conditions in which such gallants would have courted their ladies: at night, under cover of darkness. Furthermore, the architecture of the Heian period made the interior of the house where the lady stayed quite dim even in daytime. Thus, it is quite likely that a suitor’s appealing scent would be the clearest physical impression she could have of him. But what of today? As mentioned earlier, in later centuries, incense appreciation was simplified into the appreciation of fine specimens of the rare resinous aloeswood or lignaloes (now usually replaced in blends by sandalwood). But blends continued to be made, and still are. In Japan, incense is still a part of religious culture at least, as joss sticks are burned pretty much universally in Buddhist and Shinto practice, including in home worship. I speak from personal experience that an average Tokyo citizen not only has a much wider array of incense available than a Westerner, but that it is of much higher quality. A simple religious supply store in a residential neighborhood like Kichijōji will have an entire tier of shelves devoted to joss sticks alone, with prices ranging from dirt cheap (500Y for a box of 500 sticks) to incredibly expensive (7500Y for a box of 500). The biggest difference perhaps is in the type of scents offered. True to their Heian origins, most joss sticks are blends. In a very confused exchange with the salesman at said religious supply store in Kichijōji, I asked to see “the best incense.” He raised an eyebrow in a perfect Spock impression and pointed to the aforementioned 7500Y a box premium stuff. After I exclaimed “Takai!” and laughed, he handed me a box of what must have been their most popular blend. It smelled herbal and fresh – a bit like basil, but also with a hint of something sweetly cool, like melon. I asked what the scent was, and he gave me the name (I can’t remember what it was). I didn’t recognize the word, and asked for a definition. This confused him, and we went in circles for some time. I ended up purchasing a box of cherry-blossom incense instead. (It smells wonderful, oddly enough; Japanese cherry blossoms are actually scentless). I highly recommend seeking out Japanese incense to anyone who uses it for spiritual or religious purposes, or to those who just like the smell. It’s hard to find in stores, but it can be purchased online from importers like Japan Incense. Some Japanese companies (notably Shoyeido Corporation) also sell incenses to the Western market, and thus have English language websites. The most popular gods in the Pagan community are drawn from the Norse, Greek, Egyptian, or Celtic pantheons. Loki, Apollo, Isis, and Brigit are incredibly popular deities. Their original cults, however, are long dead. Modern pagans and polytheists need not fear stepping on anyone’s toes when they invoke Odin or Bast. Certainly, there is a great deal of bickering between the reconstructionists, the eclectics, the Neo-Wiccans, and the people who were just minding their own business when the Morrigan showed up, but for the most part, the arguments about how one should properly honor Diana take place between people who were raised practicing some other faith. How then does one honor a pagan deity whose worship is still very much alive? For one thing, one does not call them “pagan.” Ganesh is Hindu. Guanyin is Buddhist and not actually a goddess, so stop calling her one, because she worked really hard to become a bodhisattva. Hindus and Buddhists are not Pagan. Not all witches are Wiccans. Not all pagans are Wiccans. Not all magic is witchcraft. Satanists aren’t evil. They can be pagan if they want; a lot of them are pretty nice people. Are we cool here? Good. Let’s move on. If you worship a god from a living religion, there is one thing you must keep in mind above all else: the practitioners of that religion are totally justified in telling you how they feel. You are worshiping their god. If they don’t like it when you pair Ganesh and Lakshmi on your Wiccan altar listen to them. Nobody can make you change what you’re doing, (Ganesh and Lakshmi might not even mind it – though I kind of think they’d find it weird, especially Lakshmi) but if you don’t acknowledge that Hindu (or Buddhist, or Shinto) gods belonged to the Hindus (Buddhists, Shintoists) long before you ever heard of them, you are behaving in a manner that is insensitive at best, and racist at worst.